Delegates at the 59th CSW in 2015. Photo: UN Women/Ryan Brown/Flickr. (CC BY-NC-ND). Some rights reserved.The Commission on the Status of Women (CSW), held annually in New York, is the UN’s preeminent event for gender equality. In formal proceedings, delegates of member states agree commitments for policy actions. 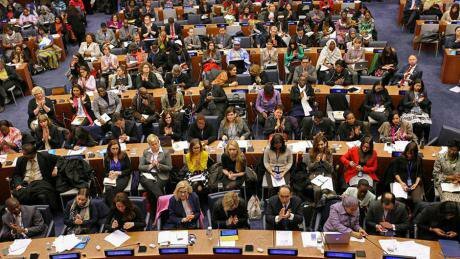 At the 62nd CSW last month, the central theme was the empowerment of rural women and girls. Agreed conclusions, and the secretary general’s report, promote a vague vision of rural women’s empowerment – one for which no particular government or UN body is accountable. But empowerment is not just about having an income and access to healthcare and education, as these documents suggest. Rural women, especially those of indigenous heritage, face particular obstacles to realising their empowerment within a global context of limited government protection of human rights, and excessive corporate power. Transnational corporations, in collusion with governments, are actively engaged in exploitation and violence against women in rural areas. Extractive industries have a particularly egregious track record. Yet, at the CSW, official documents and proceedings failed to highlight the sinister role that systems of corporate power play in disempowering, and silencing, rural women. A report from the Mesoamerican Initiative for Women Human Rights Defenders shows increased attacks against women human rights defenders across Latin America since 2012. The most frequently attacked: those working to protect land and territory. Berta Cáceres, the world-renowned human rights defender in Honduras, was assassinated in 2016. She was an indigenous Lenca woman fighting the construction of the controversial Agua Zarca dam project. Cáceres’ children have continued the work of COPINH, the indigenous rights organisation that she founded. Her daughter Bertha Zuñiga Cáceres has at 27 years old already survived an assassination attempt. Bertha Zuñiga was at the CSW this year, talking at parallel events alongside other rural women land defenders who shared similar experiences of violence, criminalisation, harassment, and sexual abuse at the hands of state, military, and corporate actors. Cáceres’ murder, and the attempted murder of her daughter, are examples of the grave risks associated with being a rural and indigenous woman who dares to confront corporate power. Women human rights defenders are targeted because of their work, but also because they are women who dare to challenge deep-seated patriarchy. In the absence of binding, international laws to regulate the human rights impacts of transnational companies, and alongside weak legal and judicial systems at national levels, they fight steep uphill battles for their rights. As long as corporations and governments can commit acts of violence with impunity, being a woman who speaks out publicly for her rights can get you killed. Outside of formal CSW proceedings, NGOs and civil society groups are invited to organise their own parallel events around the talks’ priority theme. There were multiple parallel events at this year’s CSW related to rural women defenders resisting corporate power and impunity. Women’s rights activists shared their experiences of organising and fighting against extractive industries and damaging ‘development’ projects. Many also expressed that the official CSW talks and conclusions didn’t represent them. At the CSW, where the end goal is getting member states to agree to the same set of conclusions, anything that is too specific, or too political, gets left out. Exposing networks of corporate power and abuse would implicate a lot of people, institutions, and call into question the dominant model of neoliberal economic development. In other words, the work of women human rights defenders like Berta Cáceres seem to challenge global economic and governance structures too much to be incorporated into CSW conclusions. Amid closing space for civil society in countries around the world, and with women human rights defenders under attack internationally, global spaces for women’s rights advocacy are more important now than ever before. Women human rights defenders need international support to pressure governments into responding to corporate human rights abuses, challenge extractive models of development, and end corporate impunity. The CSW, whose mandate is to promote the empowerment of women and girls, can and should do more to support them.